It has been sometime since we have ventured into cuisine from the land of Nawabs. Biryani, though popularly identified as a rich food that emanated out from food habits that boasts of richness and subtlety of Nawabi cuisine, it is equally popular among the commoners. 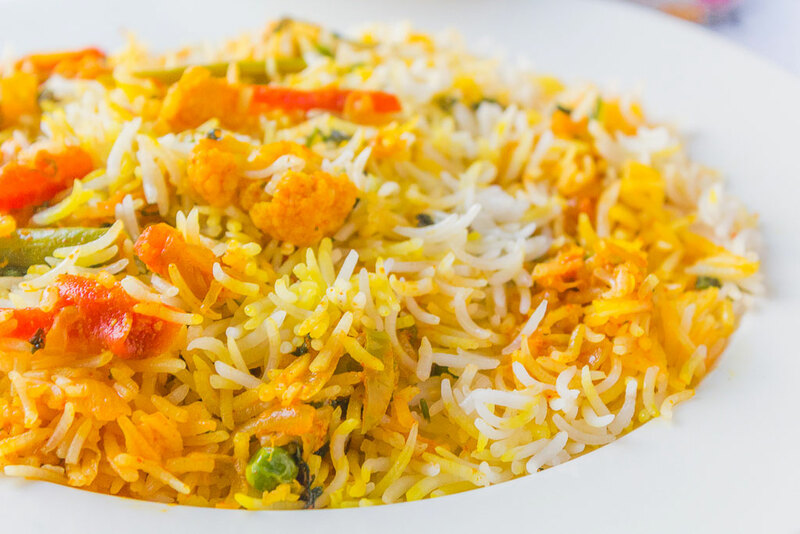 We have prepared some flavorful preparations like Mumbai Jhinga Biryani and Mutton Pulao in past, so it was warranted of us that we made a delicious and equally rich preparation of biryani with veggies. 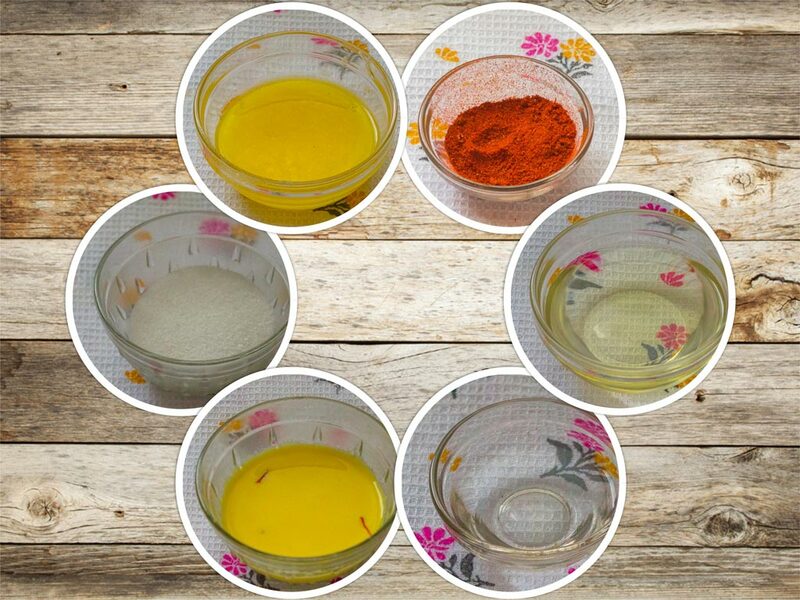 We have borrowed this recipe from the land of Nawabs of Lucknow. 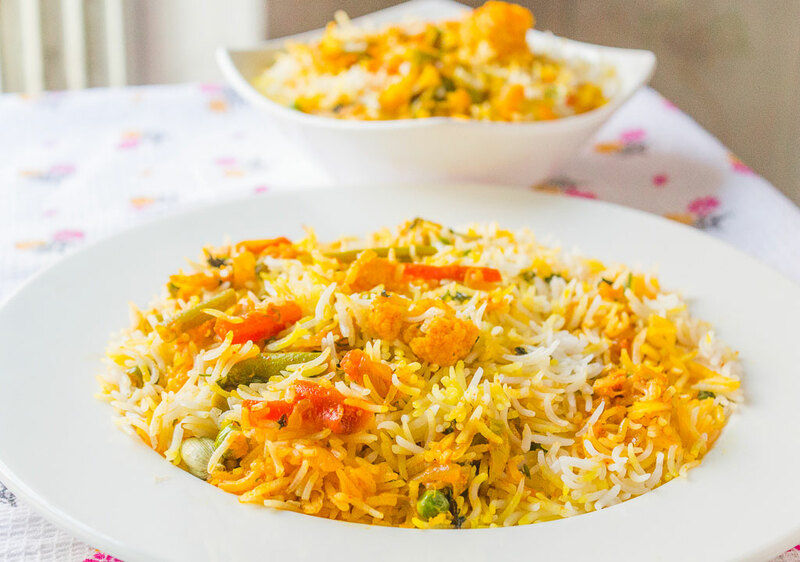 Like any biryani preparation, this one is equally elaborate in its preparation and the end product richly satisfying. It would be wrong to put this recipe or for that matter any biryani recipe into compartment of “quick meal”, biryanis by any stretch of imagination can never qualify for meals cooked in jiffy. 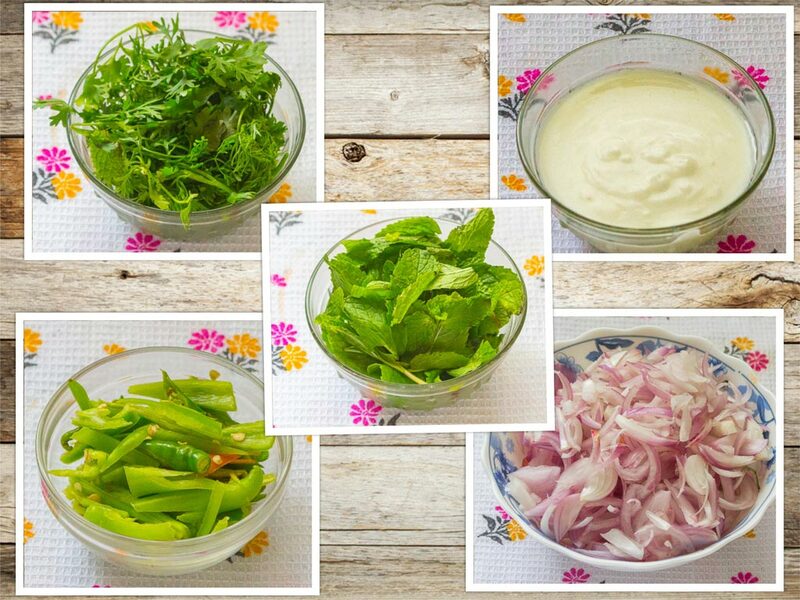 On the contrary, it needs a great deal of attentiveness, zeal and passion, qualities possessed by those inventive and quick thinking khansamas that worked in kitchen for Nawabs producing recipes that would please the sight and palate of demanding Nawabs. 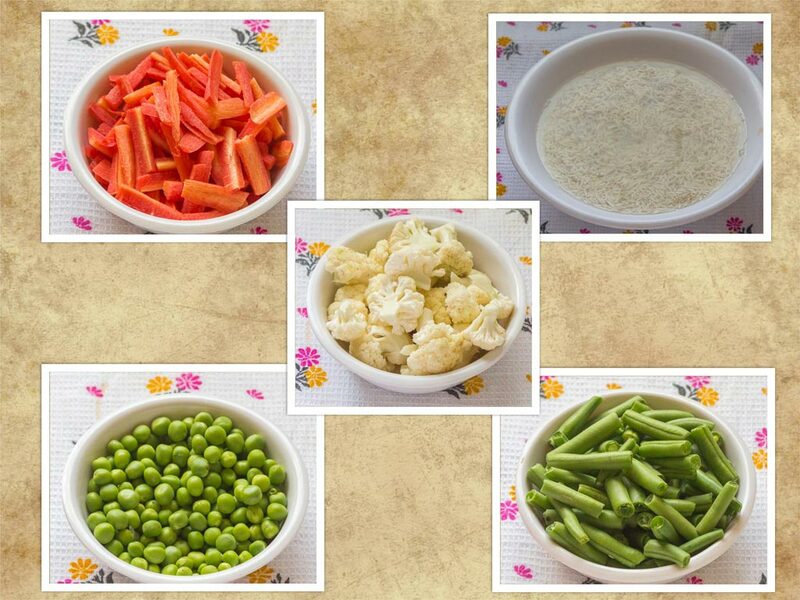 We have used commonly available veggies like cauliflower, beans, carrots and fresh peas that makes for an interesting medley of colors and taste in the biryani. The choice of rice also plays an important role in the finished product. 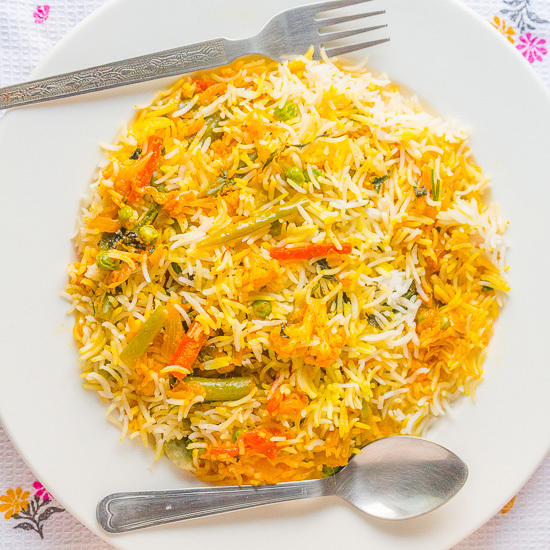 Preferably for biryanis originating in northern India long grain basmati rice is used. In southern India, there are other varieties of rice like kaima, kala bhat that is preferred over basmati. More on this in a later post that would be dedicated on biryanis from South India. 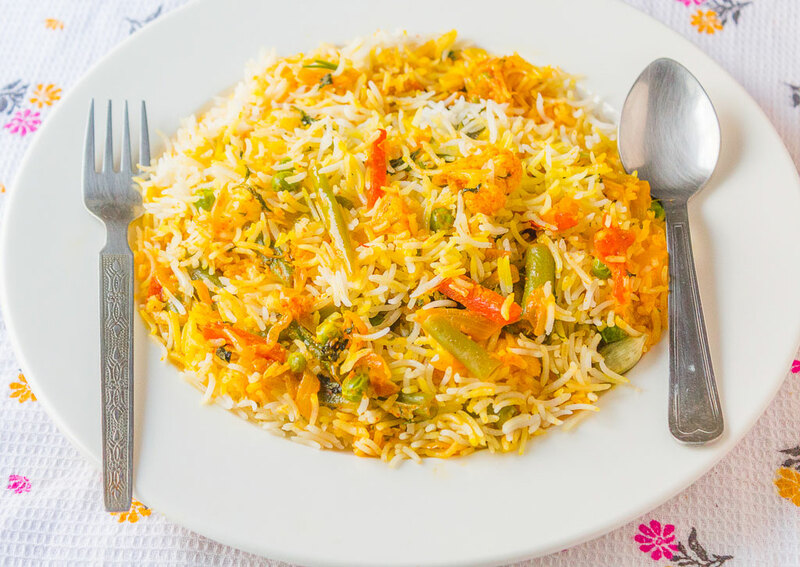 Basmati rice and the vegetables are cooked separately and then assembled in a handi and scented with screw pine water, flavored with mint leaves, coriander leaves and saffron infused milk. The Handi is then sealed with dough and kept on an iron griddle for slow cooking which traps all the flavors and permeates in the biryani making it rich, and full subtle of flavors. Treat yourself with this biryani for your Sunday lunch and remember to share your feedback in the comment section below. In a large pan, heat 2 liters of water.Season the water with 1 tsp salt. Add cloves, cinnamon, green cardamom, mace flakes. Finally add rice and allow it to cook on medium flame. We will steam the vegetables now.Boil 2 cups of water in a pan. Add green peas, cauliflower florets. Add carrots, french beans. Allow the vegetables to simmer with boiling water. We will cook veggies for 5 minutes.Drain the water and keep the veggies aside. Heat 4 tbsp Oil in a Biryani Handi. Add sliced onions and fry until it turns golden brown. Onions turn golden brown in about 10 minutes. Add garlic paste, ginger paste.Bhunao for a minute. Now add green chilies, some coriander, some mint leaves.Bhunao for another half a minute. Now add curd. Allow it to simmer on low heat for a minute.Now add turmeric powder,red chili powder, salt to taste.Bhunao for 1-2 minutes. Add steamed veggies to the Masala.Bhunao for 2-3 minutes.3 minutes later turn off the flame.Let us now assemble biryani. Meanwhile, put an iron griddle on flame. Remove half of the cooked vegetables from the pan. Spread half of the cooked rice on top of vegetable layer.Spread the rice evenly.Add some mint leaves.Add some chopped coriander leaves.Pour some saffron infused milk.Pour some clarified butter.This completes the first layer. We will keep the sealed pot on direct high flame. Now put the sealed pot on iron griddle for 2 minutes and cook it on slow heat for 8 minutes. Hello, I thought your post was good! Thanks for stopping by and posting your feedback! Keep visiting, enjoy cooking!! I prepared Lucknowi Biryani as per your suggestion. We totally enjoyed it! My family is popular among our relatives for it’s Dum Biryani. But now we got a brand new Lucknowi Biryani to crave for. Thanks a lot! May your blog prosper. Thanks for such a lovely feedback Manish. 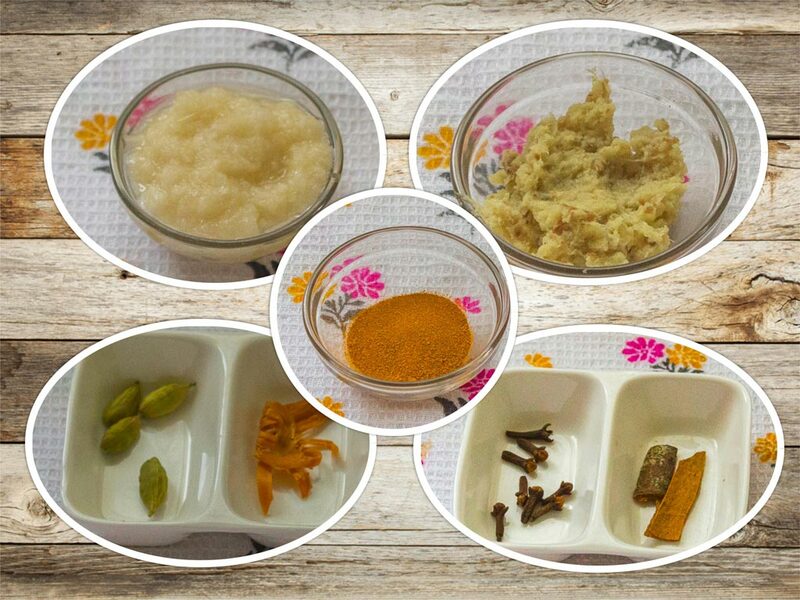 We are really glad to know your family had a great time together and you loved the recipe. Thank you again for your wishes. Thanks a ton, again !